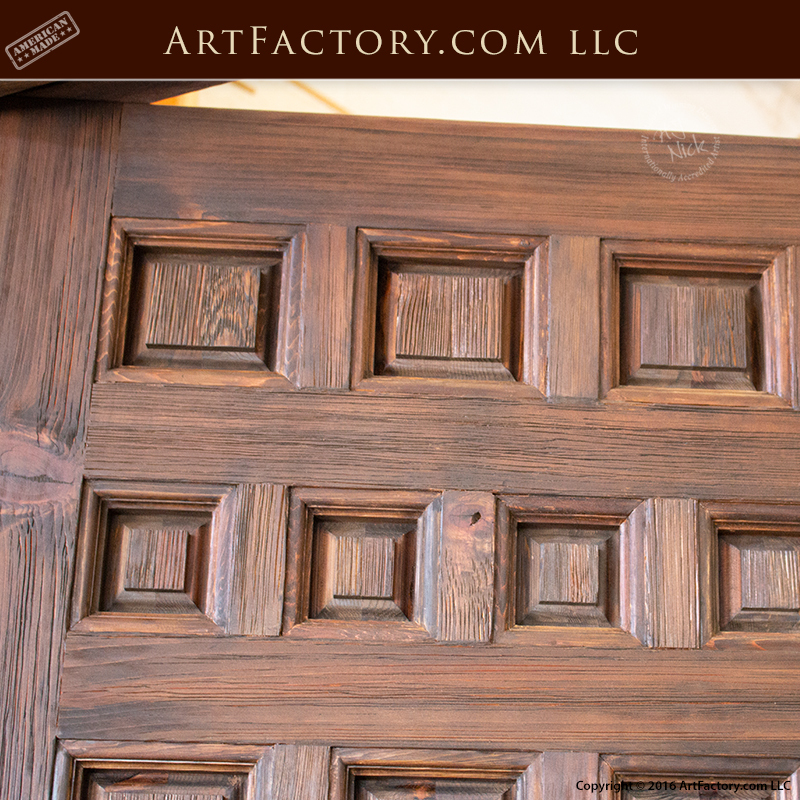 At ArtFactory.com we specialize in making one-of-a-kind, custom, fine art quality, labor intensive, entrance doors that are built to stand the test of time. We offer unlimited customization options so that you can have a custom entrance door that uniquely represents your personality. Our custom variable sized wood panel door is built from solid wood with a raised grain effect. The symmetrical, raised panel design is the work of our master woodworkers who cut each raised panel to exact size, and then each is fastened into the mortise joint. 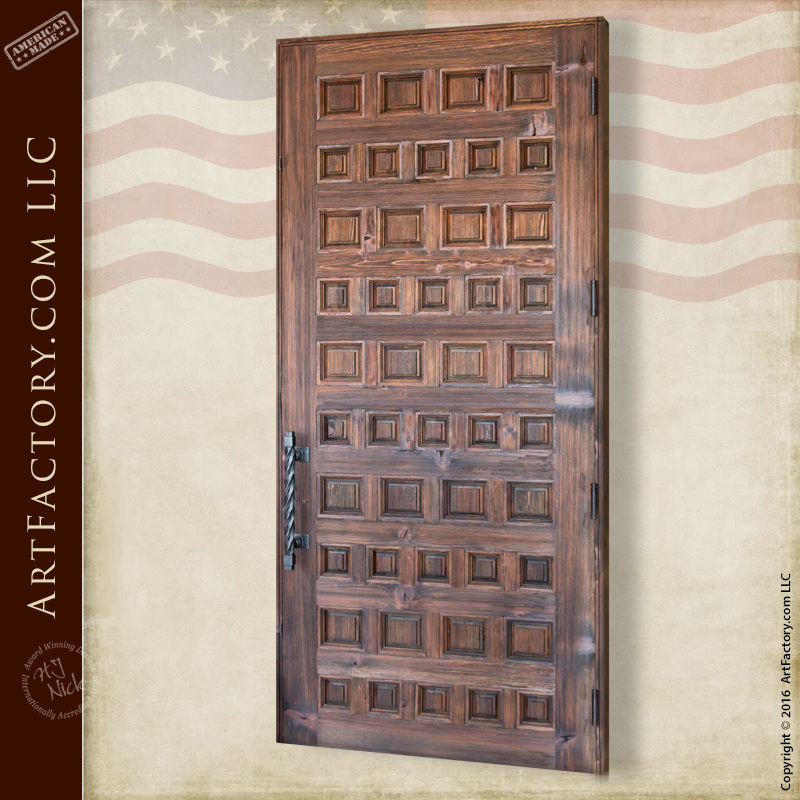 This door features a pattern of alternating rows of 4 and 5 raised panels. As a result the custom raised wood panel door provides a very unique take on a classic style. Many of our doors are exact originals of old world designs made in same hand and materials and are not fast process reproductions. 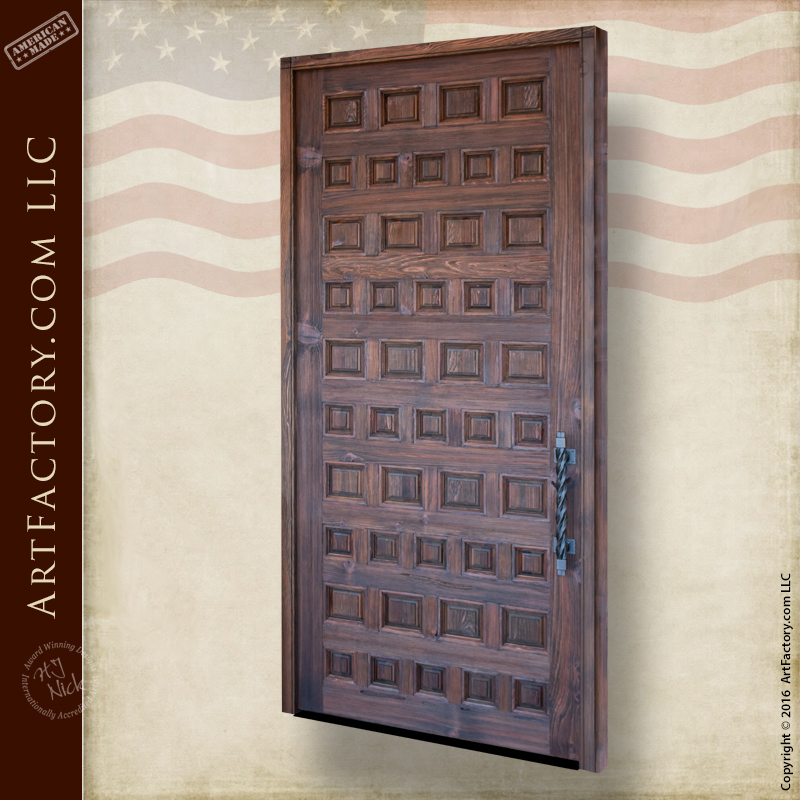 All of our custom wooden doors are built with all natural materials and are handmade by master craftsmen. 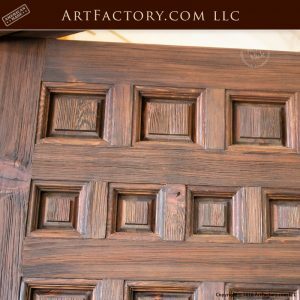 It is our belief that using all natural materials is especially relevant when creating fine art quality doors and furnishings. We build doors with sold, full length, naturally air dried timber that is hand hewn with mortise and tenon joined construction. This type of materials and craftsmanship makes for a custom variable sized wood panel door that provides maximum security and durability. Furthermore, all of our wood door are finished with a multi-step hand rubbed process that blends the stain into the grain of the wood. This process makes for a fine art quality finish that will remain beautiful for generations. The custom variable sized wood panel door as pictured features our rugged twisted iron door pull (HH572) with a medium black patina finish. Our doors are sold as a complete package if you request it. That means pre-hung in a solid wood structural jamb that built to hold the wall up with all necessary elements in stalled such as locks, door sweep, threshold, and weather stripping. In addition, every door can be ordered with fully customizable, hand forged wrought iron hardware. In other words, every detail of your custom entrance all the way down the hinges, is of fine art quality. 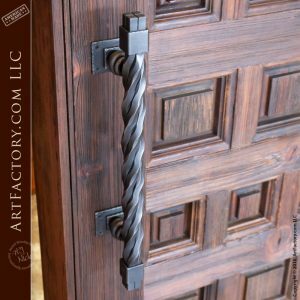 All of our custom door hardware products are hand forged by master blacksmiths. This means pure, solid wrought iron hand hammered over a coal fired forge. We use wrought iron because its the best in the world and requires no maintenance. The custom variable sized panel door as pictured features our popular rugged twisted iron door pull with a medium black patina finish. We can finish your hardware in any color that your wish using our proprietary advance patination process. This process uses am iron oxide patina that is hand applied, and then infused to the metal at over 1000 degrees Fahrenheit. A heat infused patina makes for a finish that won't crack, flake off, or peel like paints and powder coated finishes. Our finishing process produces a fine art quality finish that will stay beautiful forever with little or no maintenance. At ArtFactory.com, all of our products are built under the supervision of award winning artist H.J. Nick. Each item that is produced at our world class facility is individually inspected by H.J. Nick to assure that it meets all appraisable fine art quality qualifications. He also signs every item, thus ensuring an investment quality product that has future appreciable value in antiquity as fine art. When you buy a custom door or home furnishing from us, you a buying an heirloom quality product that can be passed down through your family for generations. It is our belief that our combination of top quality materials and master hand craftsmanship allow us to offer a quality of product that is unmatched anywhere, at any price. In fact, we are so confident in the quality of our products and craftsmanship that we guarantee everything forever. Most importantly, every product that we sell is manufactured in the USA, at our Scottsdale, Arizona factory. When we say made in the USA, we mean it, just as we have since 1913. When nothing but the best will do, call us at 1-800-292-0008 to speak with one of our talented design engineers. Get a quote for a custom variable sized panel door, or any of our other fine art quality products today.